When communicating with toddlers, sometimes we can’t get them to stop asking the question, yet as adults, we’re probably not asking it enough. Why? I think it’s the simplest, most important question in business. Why are we creating a particular product, developing a particular feature, offering a particular service, targeting a particular market? Why will customers choose us over our competition? Why does it take so long to complete a certain task, update something, fix something, create something, etc.? Understanding why helps us determine a root cause, a need, a value, an opportunity – an overall reason for taking an action. I find too often action is taken or work is being done without knowing the intended outcome – the why. In Product Management there are a few common practices that help articulate why, practices that can be easily applied to other, non-product related work. The Who: Just fill in the blank. “As a [enter role/user/audience]….” to capture and think about the persona. The Why: You need to create something or do something to serve a purpose, so completing the sentence with “so that…” gets to the essence of the why. This allows for a first cut related to prioritization, as one can stack rank activities based on perceived importance and urgency of getting it done. Then of course there are other aspects to priority such as timing, available resources, impact, etc. which is for another blog. 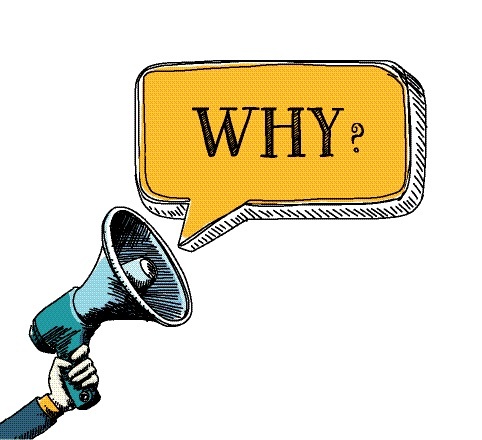 The 3 Whys– Some subscribe to the 5 Why Theory, as practiced within Toyota in the 1950’s, but I am more of 3 Why guywhen it comes to getting to the root cause or need. Whether it’s 3 or 5 whys, the key is to seek to understand the truth by pealing back the layers, and don’t stop with just a single question. It’s a practice that has served my team well over the years, and an easy activity that can generate great returns. So let’s seek to find the toddler in us all, and make sure that we continually seek to understand the root cause and/or purpose of our actions with an articulated “why,” and for whom, prior to blindly doing the what.